In a comment on an earlier post, Dmitry Epstein asked about the quality and impact of ICT4D research. I’ve already blogged about what constitutes good quality ICT4D research, so here I will just add a few data snippets on these topics. – It makes its way into the top journals: there’s the 2007 special issue of MIS Quarterly (top info. systems journal) on IS in developing countries; and I count at least four articles on ICTs and developing countries in World Development (top dev. studies journal) during 2009. – Inclusion in ISI’s Web of Knowledge is a rather rough quality benchmark but it’s a benchmark nonetheless and, as noted in a previous post, there are a few hundred papers per year within the boundaries of development informatics recorded on WoK. – Of the eleven specialist journals in the field only one, Information Development, is seen as worthy of inclusion in the WoK. – My subjective but honest opinion based on reading all 250 papers submitted to the ICTD2009 conference: the general quality of the big, fat, long tail of work in our field is pretty poor. And lastly, there’s the average news, as conveyed next, that citation evidence (if a proxy for quality) suggests ICT4D research is no better or worse than other sub-fields of research. Citation evidence is only one part of the impact story but . . . I’ve already noted that some individual ICT4D papers get highly-cited. And I should also note a bit of background on citation: work in early 2009 looked at citation rates for papers published during 1998-2008. In computer sciences, the average number of citations per paper was 3.06, ranging from 7.06 for papers published in 1998 to 0.10 for papers published in 2008 (papers take time to pick up citations). Equivalent figures are: economics and business – 5.02 average (from 10.19 to 0.13 for 1998 – 2008); and social sciences – 4.06 average (from 7.48 to 0.16). Note these are narrow citation rates for WoK-type databases; Google Scholar citation rates are much higher because they record a much wider range of published material: a 1:4 ratio of WoK:Google Scholar citation numbers looks about standard. Note also that even for papers in peer-reviewed articles, somewhere between 25% and 75% of articles – varying by discipline – are never cited in other peer-reviewed articles. – Comparing the total number of WoK citations for the four articles in MISQ’s special issue on IS in developing countries (vol.31, issue 2), with those for the first four articles in the next issue, shows no difference: both sets get 14 citations. My conclusion from all this: in terms of impact, ICT4D looks like a pretty standard research sub-field. We’re not punching above our weight but neither are we left out in the cold. – Where ICT4D research is good enough to get into peer-reviewed WoK-covered journals it is of similar quality and with similar impact to other sub-fields. Where it is good enough to get into peer-reviewed open access journals, the same is true. And where it’s not good enough for that, it’s probably pretty bad but, again, the same is no doubt true of other sub-fields. – If you want your work to have maximum impact then, on average, your best bet is to publish in a traditional journal. But open access, non-WoK-listed journals should not be regarded as “no go” areas: they are read and used. – The average (modal) ICT4D article is never formally cited, but that’s true of many research fields. – If you want to feel better about the citation impact of your work, stick to Google Scholar. – Finally, what about conferences? Of about 120 papers on ICT4D published during 2003-2008 and covered by WoK and listed as having come from conferences, six are cited having been published in journals; three are cited from their proceedings. The remaining 90%+ whether in journals or proceedings are uncited. Conclusion: conferences may be good for networking, learning, and scenery; they are not good if you want your work to have a citation impact. 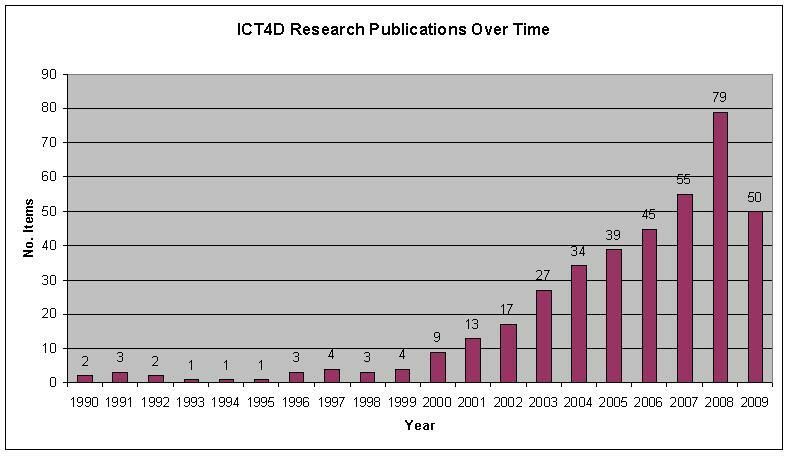 How big is the ICT4D research field? And is it growing or shrinking? The first question is harder to answer. I’ll offer an estimate based on conferences (which will only attract a sub-set of the field e.g. 350 attendees at ICTD2009, and 500 authors submitting papers) and my own contact lists. On that basis, I estimate that, worldwide, several hundred academics and several thousand PhD researchers are working specifically on ICT4D topics. They work alongside thousands of staff in donor agencies, national governments and private firms who occasionally contribute to research outputs. Several thousand more academic staff, particularly in business/management and informatics, undertake occasional research in the field. This shows dramatic growth in ICT4D research during the “noughties”: a nearly 2000% increase from 1999 to 2008; an average 39% annual growth rate. In part, this might be an “ICT effect” reflecting greater use of the term. But it does also seem to reflect more general research growth in the area of development informatics. Publications using ‘info*’ and ‘developing countr*’ grew by 80% from 1999-2008 (7% annual average); and the narrower band of publications using ‘information technolog*’ and ‘developing countr*’ grew by 153% from 1999-2008 (from 83 to 210; an 11% annual average). Just to check there wasn’t a general research growth effect, a cross-check with ‘political’ and ‘developing countr*’ showed a couple of hundred items per year published, but only a 14% growth in the literature from 1999-2008 (1% annual average). A better cross-check was with just ‘developing countr*’ which showed a 57% growth (5% annual); and just ‘ict*’ which showed a 126% growth (9% annual) during the same period. From this data, then, ICT4D research publication is growing significantly faster than cognate research areas. We can draw a similar conclusion of high growth by looking at ICT4D-specific journals. In 1999, these produced 33 articles. In 2009, they produced 182 articles; a 450% rise. This rise was very much related to growth in the number of journals: two in 1999 and eleven today (though one has yet to produce its 2009 edition, and one only produces its first edition in 2010; only one of these journals is covered by the ISI Web of Knowledge). That’s one hell of a change from 1987 when I first started academic work in the field and when, as I never tire of saying, the entire historical academic output on IT and development would fit on a single shelf of my bookcase. And it indicates ICT4D research as a fast-growing field with all the pros (greater audience, more jobs, more collaborators, more new ideas, more impact) and cons (more to read, greater competition) that brings.